The GOES-R IFR Probability fields computed from GOES-East captured the onset of Lake fog that moved onshore over eastern Wisconsin on April 29th. Multiple cloud layers associated with a strong extratropical cyclone precluded the use of the brightness temperature difference product (the heritage method of detecting fog/low stratus). However, the IFR Probability field aligns well with the reductions in visibility associated with the Lake fog. The character of the IFR Probability field can be used to infer whether of not satellite data predictors are being used. For example, the relatively flat field over southeast Wisconsin at the start of the animation is a region where satellite predictors are not used. The use of satellite predictors generally leads to a pixelated field. A flatter field as over southeast Wisconsin reflects the smoother model fields that are driving the probability field computation. Cloud thickness is computed in regions where the highest cloud, as seen by the satellite, is a water-based cloud. And that is also usually the region where satellite predictors are used in the computation of IFR Probabilities. Note in the animation above how cloud thickness generally overlays regions of IFR Probability that are pixelated. Cloud thickness is not computed where only model data are used to compute IFR Probabilities. (Cloud thickness is also not computed in the hour or so around sunrise and sunset, during twilight conditions). The slow northward movement of the fog bank is apparent in the first part of the animation above, from 0615 through 0745 UTC. Note also how the MODIS IFR Probability fields give a very similar solution to the GOES-13-based fields at 0745 UTC. Differences in resolution are apparent over southwest Wisconsin, however, where river valleys are more accurately captured by the MODIS fields. In the visible imagery at the end of the animation (1355 UTC), the rapid saturation of moisture-laden air moving northward from Indiana over the cold waters of southern Lake Michigan is very apparent. This entry was posted in Cloud Thickness, MODIS, Multiple Cloud Layers, Wisconsin on April 29, 2014 by Scott Lindstrom. 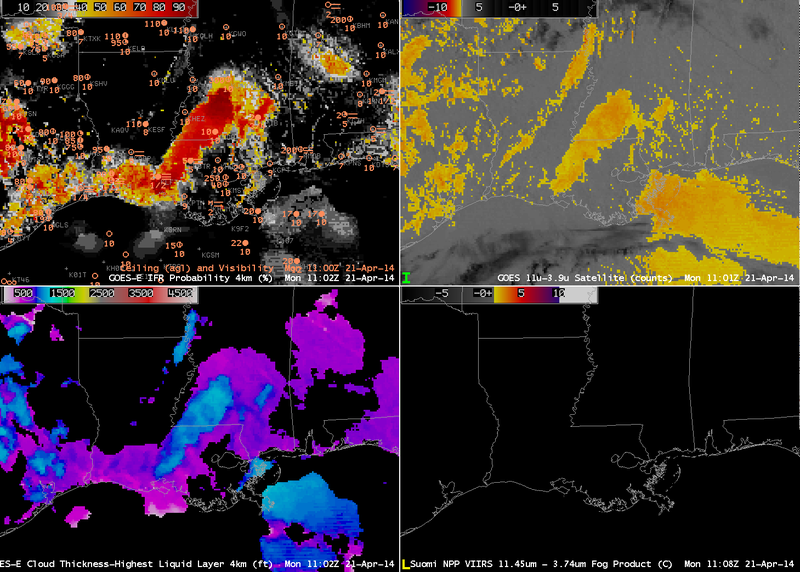 GOES-R Fog/Low Stratus products can be used to estimate the time of fog dissipation, an example of which dissipation from 23 April 2014 is shown above (complete with a temporary hole in the subsequent cumulus development). Complete dissipation of the radiation fog occurred by 1632 UTC. This chart is a scatterplot of GOES-R Cloud Thickness in the last pre-sunrise image vs. dissipation time (measured as hours after that pre-sunrise image). The 1100 UTC GOES-R Cloud Thickness is shown below; it is the last pre-sunrise image over Alabama (note that no values are present over Georgia because twilight conditions are present there). GOES-R Cloud Thickness values in the foggy region (where IFR Probabilities are high, and where ceilings are low and visibilities obstructed) are around 1000 feet. Values from the best-fit line at this link suggest, then, a dissipation time of a little over 3 hours, but the spread of values shown in the scatterplot is from less than two hours to more than four. In this present example, fog dissipated after about five hours. IFR conditions ended after about three hours. This entry was posted in Deep South, Dissipation Time on April 23, 2014 by Scott Lindstrom. BRINGING A LIGHT SOUTHERLY FLOW AND SOME MOISTURE NEAR THE SURFACE. GROUND FOG LATER TNITE…WHICH IS ALREADY IN THE FORECAST. TO DRIVE CAREFULLY THIS MORNING IF YOUR DRIVING IN THESE AREAS. SHOULD DISIPATE BY 9 AM. How did the IFR probability forecasts do during this event? At 0400 UTC (below), neither the IFR probabilities nor the traditional method of fog/low cloud detection suggest fog/low clouds are present. 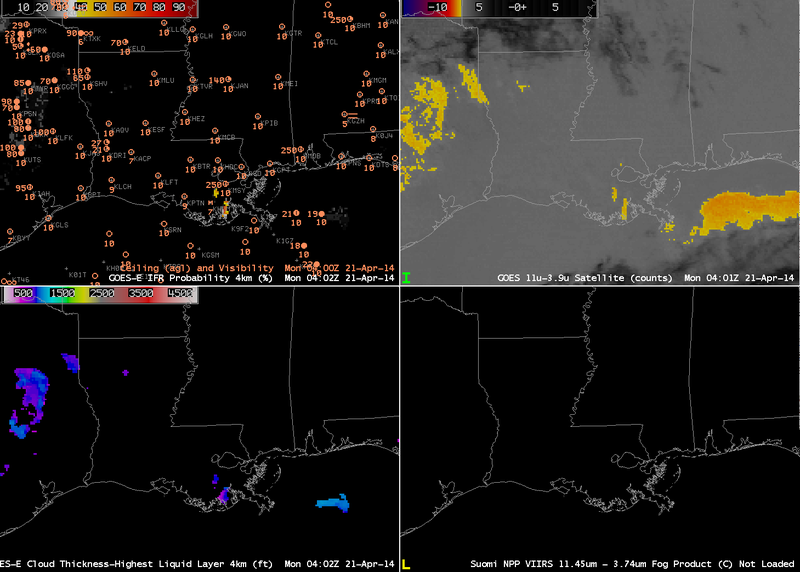 By 0600 UTC, IFR Probabilities have increased to around 10% in/around Lake Charles as visibilities have dropped. GOES-R Cloud Thickness values are around 600 feet. Just before 0800 UTC, a Suomi/NPP overpass provided high-resolution data. 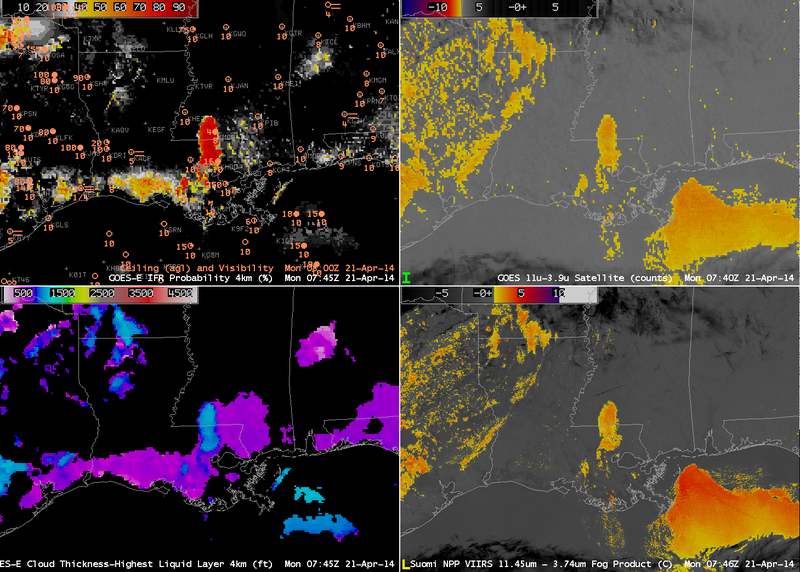 Neither the GOES-East nor the VIIRS data brightness temperature difference products show a distinct fog/stratus signal over southwestern Louisiana, where GOES-R Cloud Thickness values persist at around 600 feet, and where IFR probabilities have increased past 50%. 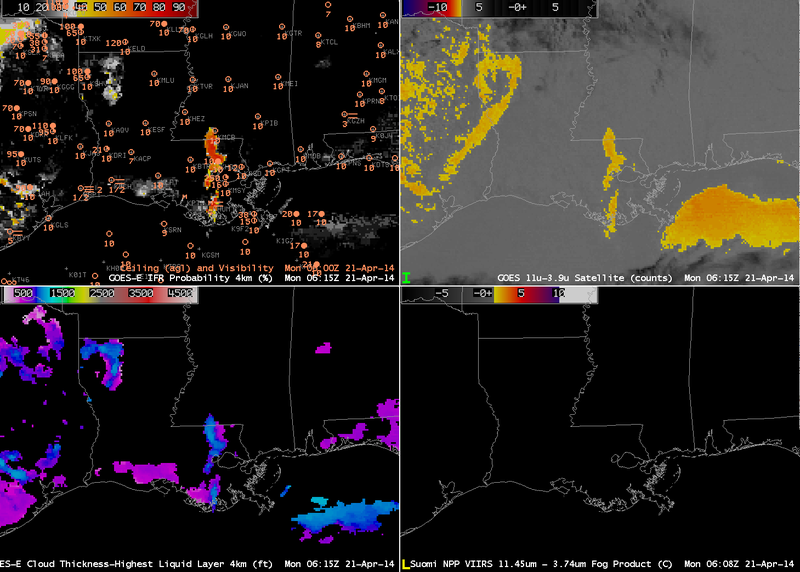 By 1100 UTC (below), when the Dense Fog Advisory is issued (hours after the IFR Proabilities first increased), the Brightness Temperature Difference product from GOES-East is finally showing a faint (albeit noisy) signal of fog/low stratus over southwestern Louisiana. A stronger signal extends northeast and southwest from Baton Rouge. This entry was posted in AFD, Deep South, Suomi/NPP on April 21, 2014 by Scott Lindstrom. A late-season snowstorm moved through the upper midwest on the 16th/17th of April, dropping up to 18″ of snow over northern Minnesota and northern Wisconsin. The storm and its aftermath produced IFR conditions; how did the GOES-R IFR Probability field do? The toggle above shows data from ~0445 UTC on 17 April. The MODIS Brightness Temperature Difference field suggests stratus over a large region where IFR conditions are not observed; the IFR Probability fields better approximate the regions of low ceilings/reduced visibilities. The inclusion of Rapid Refresh model data better defines regions of low-level saturation so that the IFR Probability Fields (compared to the brightness temperature difference fields) are better aligned with low ceilings/reduced visibilities. 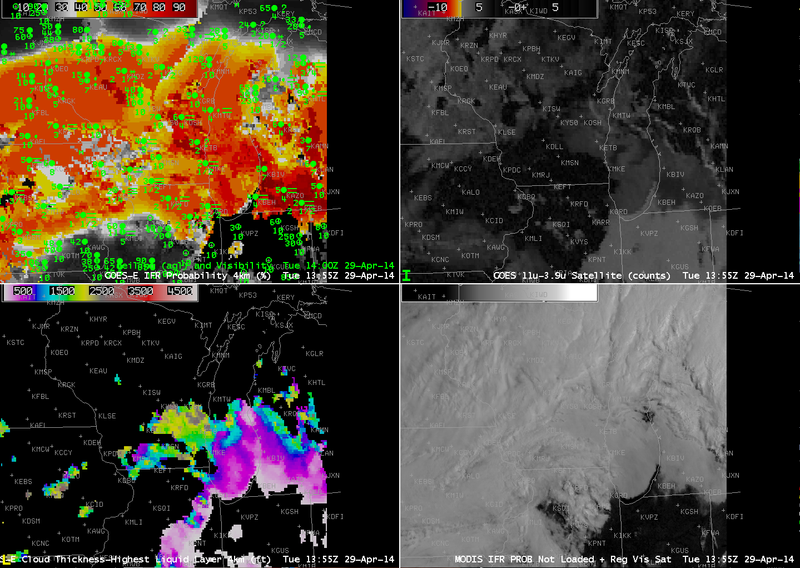 Imagery at ~0900 UTC, below, shows an expansion of the IFR conditions over southern Minnesota as the storm moves away. Note also how IFR Probabiilties are enhanced over northern Wisconsin, where multiple cloud layers make the traditional fog/low cloud detection mechanism, the brightness temperature difference field, difficult. Probabilities are smaller there because the satellite predictors cannot be used in the algorithm that computes IFR Probabilities, and the variability of the values is less, reflecting the smoother fields present in the model (compared to the pixels of the satellite data). This entry was posted in Midwest, MODIS on April 17, 2014 by Scott Lindstrom. When relatively high dewpoints move over the cold waters of the Gulf of Maine in Spring, advection fog can form. Sometimes this happens underneath clear skies, sometimes it happens underneath high clouds. In both cases, the IFR Probability field should give a reasonable answer — but how can that prediction be validated? In the example above, the apparent fog/low cloud bank propagates off to the east, and when it is fully ashore near Yarmouth, NS, visibilities drop from near-IFR to IFR conditions. The IFR probability field has an appearance that suggests plenty of high clouds are overlaying the visibility-restricting lower clouds, yet a consistent signal of higher probabilities of IFR conditions is maintained in/around the Gulf of Maine northward into Maine. This entry was posted in Multiple Cloud Layers, New England on April 14, 2014 by Scott Lindstrom.